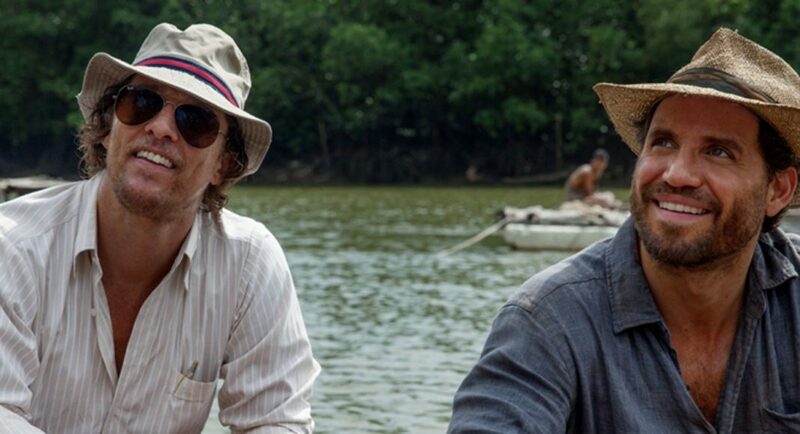 Gold Movie Review – McConaughey Delivers In A Film That Can’t Match Him - Are You Screening? Gold paints a gorgeous picture, complete with jungle landscapes and corporate boardroom shouting matches, but the spin on the Bre-X scandal doesn’t manage to deliver weight and interest. It’s not for lack of trying on McConaughey‘s part, it’s just a story with little hope without a great telling and an emotional charge. Like several recent winners – The Imitation Game, The Big Short, and even McConaughey’s own Dallas Buyer’s Club – Gold‘s story is inherently boring. It’s perhaps somewhat fascinating as a news story, but not as something to spend two hours of your life with. That is, unless you can get at something deeper and richer than the mere facts. When you’re shifting a lot of facts anyway, leading to an “inspired by” label, that should be an easier job. McConaughey plays Kenny Wells, and we’re introduced to him at a time when he’s working for his respected father’s even more respected mining company. This is a company playing in the upper echelons of the mining game. We fade to a few years later, after Kenny’s father has died, and Kenny has run the thing into the ground. He still has a few people on the payroll, but they don’t even have an office anymore, and make their daily calls hoping to get investments into anything from a bar they take over during its off hours. At the end of his rope, Kenny makes a last ditch effort to get an expert geologist, Michael Acosta (Edgar Ramirez), to team up with him. Acosta believes he knows where to find gold in Indonesia, and despite his copper strike, he can’t get anyone to back him. After a difficult time maneuvering through both red tape and the Indonesian jungle, the pair strike gold, and it’s one of the biggest finds in decades. Kenny’s value soars, which obviously wreaks havoc on his relationship with long-time employee turned wife, Kay (Bryce Dallas Howard). Now Kenny has to work the business side of things, getting investors, making deals with larger companies who can actually move the mountain, and becoming a publically-traded company. Stock soars, Kenny briefly lives the high life, and then things start to go sideways. The film has ideas for building in the emotional draws, but it has too many and doesn’t know what to do with them. Kenny is obsessed, clearly a result of failing at his father’s business, but the angle never comes together as something that actually makes Kenny more interesting. This is a film that suffers from the layering on of bullet points without ever wondering how to deliver on their value. The obsessive characteristic is never more than that, and it doesn’t build the story any more than making McConaughey needlessly look like such a stereotypical shlub. Kay is only in the film enough that you will hopefully recognize her during the later moments, and no one else who works for Kenny even needs a name. The saving grace of the film is watching McConaughey worry at a role log a dog with a bone. Playing someone who just isn’t quite smart enough to be in the game, and has little in the way of presentable, worthy motivation is tricky, and when you had that he’s a fairly unpleasant guy, who nevertheless has had to spend his whole life basically being a salesman, it’s a role anyone would struggle with. If he’d had more to work worth, this might have developed into something that was at least worth the time to watch do it. Laying the lion’s share of the blame at the feet of a film’s script is actually more rare than people probably imagine, but in this case there doesn’t seem to be a way around. Patrick Massett and John Zinman have worked together on several TV shows, and not a lot else, but their construction here leaves a lot to be desired. It’s enough to make you wonder why and how they deviated from reality, and why they would shift things to no purpose. The father story doesn’t seem to have a connection to reality (though I admit I’m no expert), nor does the high to low trajectory of the company. If you’re changing the actual story to facilitate a sham prop of desperation and motivation, that you don’t even actually want to do much with, it’s easy to see how the rest of the story is going to play. Still, it never completely falls apart, and though you won’t remember it long and much of it feels familiar, it does highlight just how crazy the system can be.